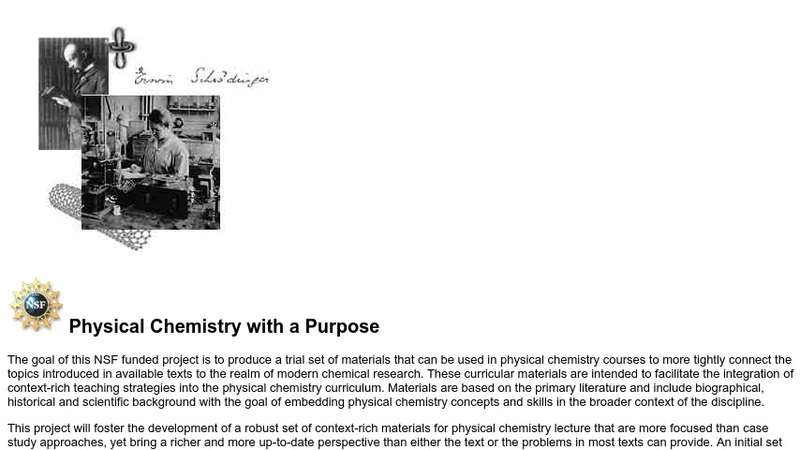 "The goal of this NSF funded project is to produce a trial set of materials that can be used in physical chemistry courses to more tightly connect the topics introduced in available texts to the realm of modern chemical research." Six modules are currently available at this website, with four more planned by 2006. Each module supplies a reference to a chemistry article, background information, sample questions to stimulate students to think critically about the subject matter, and additional sample chemistry questions. If users are interested in the entire module, they need to contact the author by the email provided. Educators can learn about the teaching approach used in the materials and why the authors feel they are important for education.